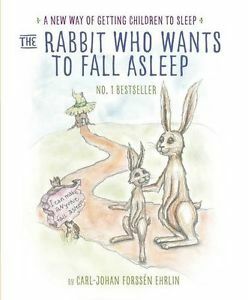 We were recently invited to take part in a trial of the much-discussed book "The Rabbit Who WantsTo Fall Asleep" by Carl-Johan Forssen Ehrlin - a Swedish teacher of communications, a life coach and a leadership trainer. He has combined all of these skills and experiences in developing the techniques in this book which is said to help children to fall asleep and has been hailed as the answer to the prayers of parents everywhere! I had read about this book previously and been very tempted to try it myself - my 2 and a half year old son Tyne has never been a great sleeper, and his sleep routine tends to change every now and then - sometimes he's happy to go into his own bed and fall asleep, other times he'll spend weeks refusing his own bed and wanting to sleep in ours, getting very upset at bedtime and taking anywhere from 20 minutes to an hour to fall asleep. We gave the book a try over four different nights, following Tyne's usual bedtime routine of an evening bath and going up to bed to have a story. The book has a page for the adult with instructions on how to read it - you are to exaggerate the bold print, read the italic print slowly and calmly, and insert the childs name and yawns in various places. The book is quite long, and I personally found the story didn't make a lot of sense and with so many instructions to follow it was difficult to concentrate on even for me as the reader. My son seemed to struggle to hold any interest in it, and wasn't paying any real attention to the story. You can alter the way you tell the story as you need to, which I did try but my son seemed to have already decided he didn't like the story and wasn't going to listen to it...which is quite unusual for him as he usually loves books and being read to! He didn't fall asleep during the story on any of the occasions we tried it, but on some occasions he did calm down a lot during the story and was easier to soothe to sleep afterwards. I do wonder if perhaps he, at 2.5 years old, was a little young for the story and whether it would be more successful with a slightly older child who can concentrate on the words more. Although we didn't have any success with the book personally, I have read many accounts from friends who did and would certainly try it again in the future with other children as every child is bound to respond differently. I would also be interested in trying the audio version as perhaps it was my own reading of the story that limited its effectiveness? I downloaded the audio version earlier this week and tried it on my 4 and 6 year old last night. They were both tired and fell asleep within less than 20 minutes and my eldest was really impressed by it. I'm out tonight so going to give it to my mum to try with them and see how it goes. The male voice on the audio is soothing and the music in the background complements this too so perhaps it is the better option for some?